OnePlus is slated to launch its next flagship, the OnePlus 2 in little less than a week from now. We’ve been hearing quite a lot about the OnePlus 2 so far, with the manufacturer already having confirmed the Snapdragon 810 on it. The OnePlus 2 is also expected to come with a fingerprint sensor, USB-Type C connectivity and a metal body to make the device a complete flagship. The OnePlus 2 Scores Nearly 64,000 On Antutu – True Power Of The Snapdragon 810? After we saw some rather disappointing benchmarks yesterday, in which the OnePlus 2 managed to beat its predecessor by only a couple of hundred points, some new benchmarks of the device have surfaced. 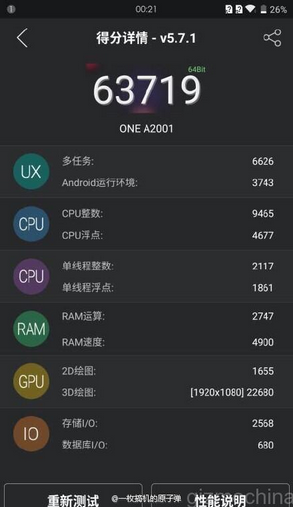 The OnePlus 2 managed to get only 500 points or so above the OnePlus One, which comes with the Snapdragon 801. This led to beliefs that perhaps the company had resorted to underclocking the Snapdragon 810 to prevent it from heating up or had failed to solve its throttling. But today’s benchmarks, if accurate, end up showing the true power of the Snapdragon 810. The score of 63,719 is more of what we’ve seen Qualcomm’s top silicon produce – when its not shifting peak loads on its lower cores. We’ve seen other Snapdragon 810 devices such as the HTC One M9 and Xiaomi’s Mi Note Pro achieve scores in the same range as well, so the OnePlus 2 should do fine as well. The company’s due to launch its flagship device on July 27th in a first of a kind, unique virtual reality event. OnePlus has already sent out its cardboard headsets for users to plug in, so if you’re one of the lucky ones, be sure not to miss out. The virtual reality event will allow users to interact with the device in interesting ways and we’ll be right here to provide you with all the updates. So stay tuned and let us know what you think about the OnePlus 2’s benchmark scores in the comments section below. OnePlus 2 Hits 3 Million Invites; Will Company Be Able To Reach 5 Mil Before 2016?